Glenn and I have been living in Ecuador for 3 1/2 years now. Our first 11 months, we lived in the Ally Micuy Hotel across from the Policia. During that time, our stay was made much more enjoyable because Isabel, the assistant manager of the hotel, greeted us most mornings at breakfast. She became a good friend. 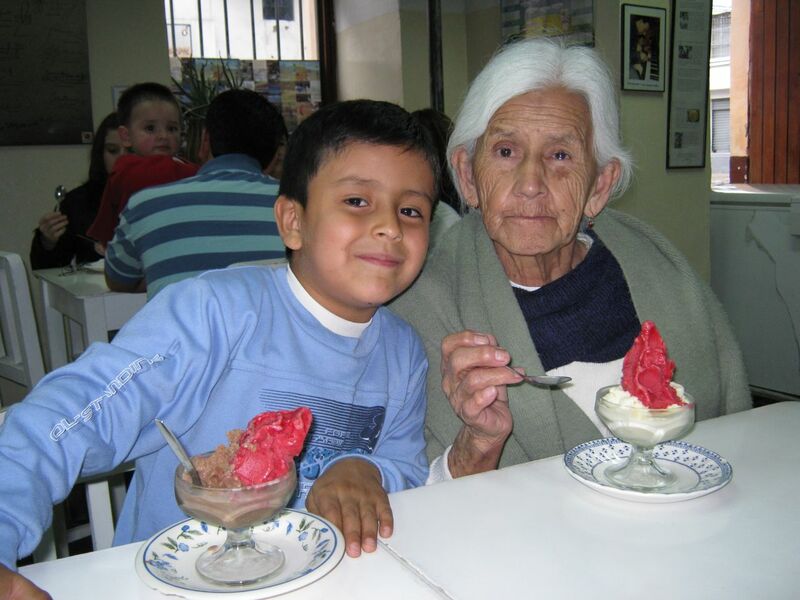 One of our first activities with her and her family was a little excursion to Ibarra for ice cream. Isabel owns no car, nor had she or her family gotten to go on mini-vacations, probably for years. We squeezed her mother, Victoria; her 7 year old son, Brayan; her 21 year old son, Elvis; she; Glenn, and me into our 5 passenger car (that’s right; you counted 6 passengers in the 5 passenger car) and headed to Rosalie Suarez. It’s about a 25 minute ride each way to Ibarra. Over time, over café and meriendas, in her 2nd story apartment (Elvis, Isabel, and I rolled Glenn’s chair up the stairs for these events), we all became better friends. By our 7 month mark, we had solidified the friendship sufficiently to ask them if they might enjoy going on a vacation together for a week. 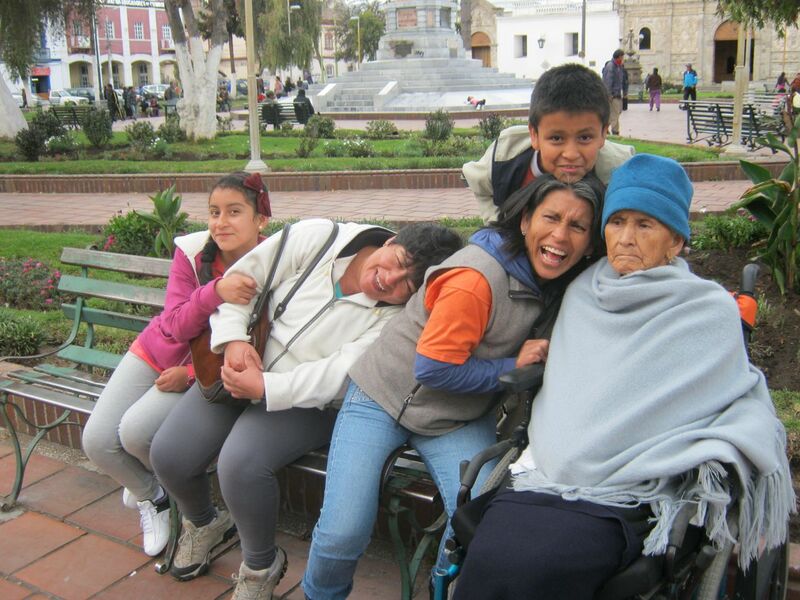 Victoria, who was 85 years old at the time, had never been to Cuenca and wished to see this Ecuadorian city before she died. We all decided to have our vacation there that first summer. Over the years, the family has had numerous times when they thought Victoria was near death. And all of those numerous times, she has rallied and gotten better. I have noticed that people here in Ecuador use the present tense (“I have cancer”) whether they are in remission or not. Whether Victoria was misdiagnosed and has/had some sort of growths or uses the present tense because she has been in remission for a number of years, I am uncertain. For the first 3 years we knew Victoria, the cancer caused some pain, but did not prevent her from many good, enjoyable days. On numerous days, we have taken her on picnics, on vacations, to hot springs, on drives. Family gatherings have taken place at our house. 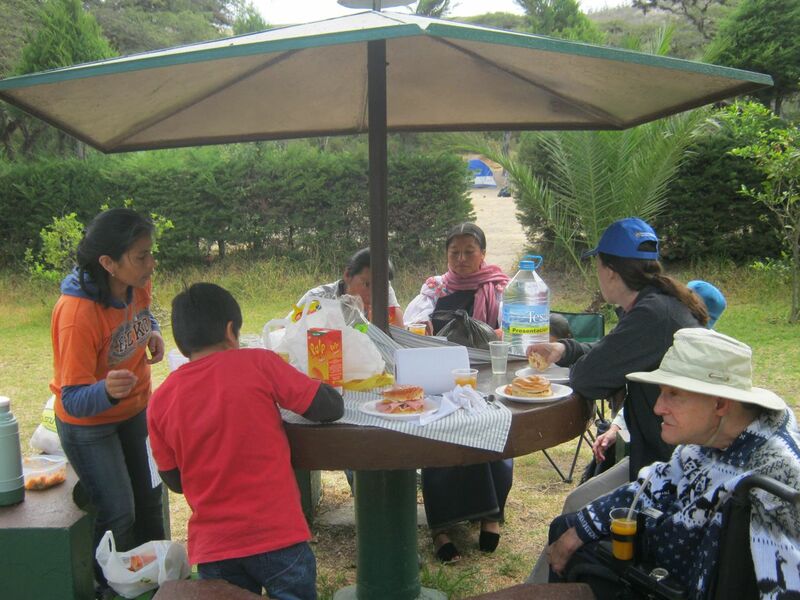 Ecuadorian and Christian holidays that included special meals have been prepared and eaten there too. But a little before this last trip to Villcabamba she was different and during the trip she seemed removed. Victoria did not rally and enjoy the drive or the views from the car window or the family conversation. She mainly slept. Her pain now seems to be constant. She has quit eating and only drinks Ensure, coffee with milk, hot soups. She no longer comes to our kitchen table for meals. She no longer showers every day. Now, she mainly lies in bed. The family took her to a doctor a few days ago. He ordered some blood work. She has an infection so he gave her antibiotics and something stronger than Ibuprofen for her pain. The doctor beat around the bush and suggested we put her in the hospital because she is more difficult to care for. Most people with family members in the free hospitals station a healthy family member to stay with a person in the hospital. There are never enough nurses for good care and the food is purported to be close to unpalatable. They could have x-rays taken, but cannot afford them, nor would they particularly be of much benefit other than letting the family know more about what the problem is. The family already knows there is a problem and that it is probably the cancer that has spread throughout Victoria’s body. Now we know that Victoria is probably near the end of her life as the doctor in his indirect way indicated this to be the case. Now we wait. Will it be weeks or months? The family (including me) lives in limbo. In some ways, we are already mourning her passing. I can tell I am still a Norte Americana by the way it is hard to adjust to not being able to plan the funeral, the family gathering, the getting on with one's life. Meanwhile, Victoria mainly stays in bed, sleeps, cries with any family member that might drop by for a visit. But wait! Last night she ate rice and an egg. This morning she had fruit juice, another egg, and coffee. She feels better. The antibiotics must be working. Isabel told me that when she was talking to Elvis the other day and feeling very sad, Elvis said not to worry, that Victoria always comes around. It looks like he is right! Again, it might just be a false alarm. I hope Victoria’s family continues to come around and visit her. I hope she has less pain. I hope she regains some of her strength so she can again go on shorter excursions. Death is something Glenn and I are much closer to at our age and I guess I think about it more. It would be good for me to live each day as it comes, to focus on now. I pray that when Victoria passes, she is at peace. And I also pray that when I am older and less healthy, I too can be at peace for I have grasped my abilities and my time here on earth and have done what I can and enjoyed all the good times. As usual your letters describe your activies so well I almost feel like I am there. I so enjoyed following your "adventures" through each of your blogs, but your blog about Victoria really touched my heart. Joy is coming in the morning--but may peace, and comfort, fill her days on earth. Glad you had an enjoyable visit and could celebrate Halloween! Just before the end of June, Marilyn announced that she wanted the month of July to be fun-filled. 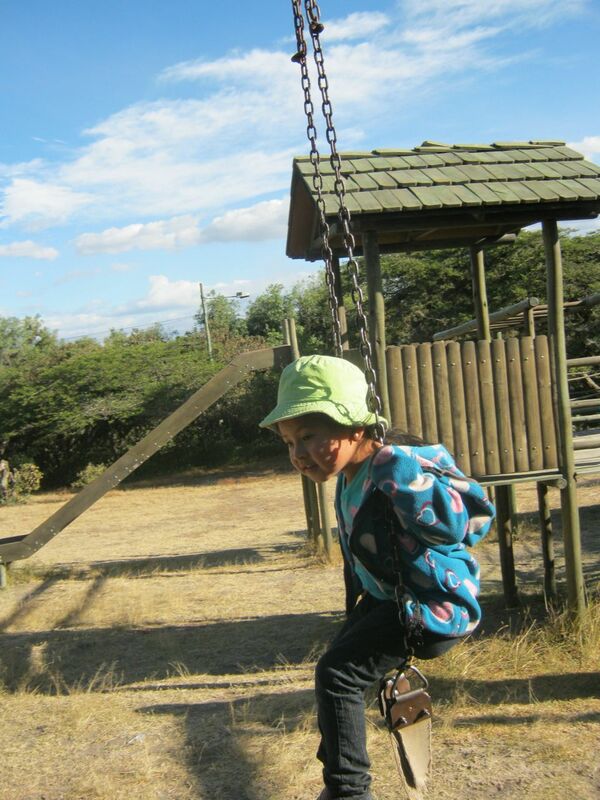 After all, Brayan was out of school and we didn't have a lot of work we had to do until August. At least, Marilyn didn't have a lot to do. I still had things I needed to do on FEDICE's Website development. Poor me. 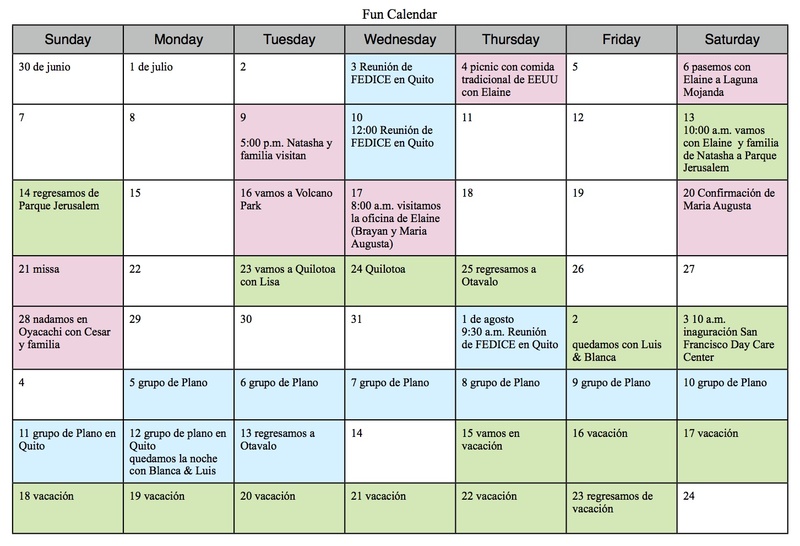 In typical efficient-Marilyn-fashion, she devised a calendar for the months of July and August. (August was included because we'd be taking our family vacation after the departure of a missionary group from Plano, TX.) Let's call it the Fun Calendar. My first reaction when Marilyn showed it to me was dismay. How in the world would I ever find time to work on FEDICE's website, as well as read an average of one book a week (which I try to maintain), as well as steward our finances, as well as read news articles, if half the month were taken up with fun activities? Obviously, the work ethic in me had not yet relaxed. Marilyn has adjusted to the laid-back atmosphere of Ecuador better than I have - and I'm supposed to be the fun guy, or at least I was the fun guy at one point. After a day, my initial shock caused by the Fun Calendar wore off. I warmed to the idea. And I found myself able to get my perceived work done, read even more than one book a week, and keep our finances on track. And here I am writing for the blog to boot. Oh, and I had fun. Just goes to show that I budget my time more wisely when I have many things on my plate than I do when I feel I have time to kill. 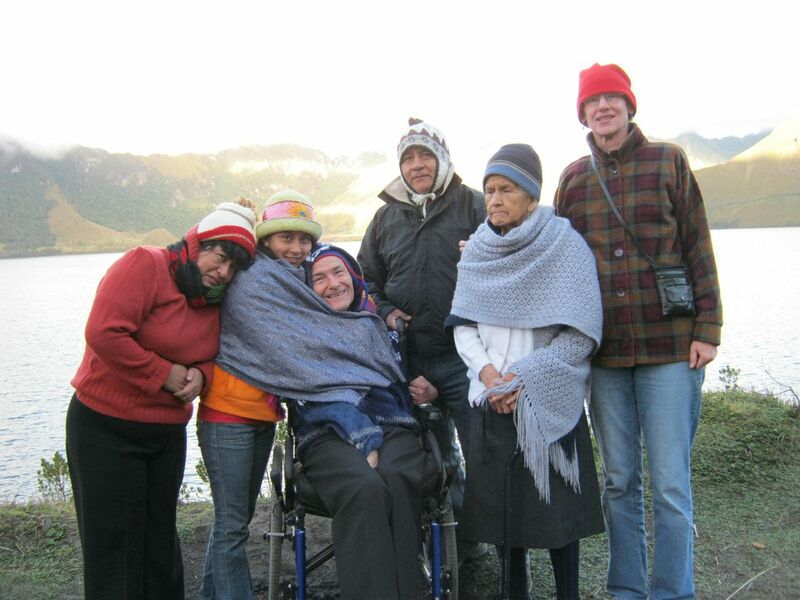 When we went to San Francisco, Cotopaxi, Ecuador so Marilyn could teach English for a week, we didn't get to work as fast as one might think. 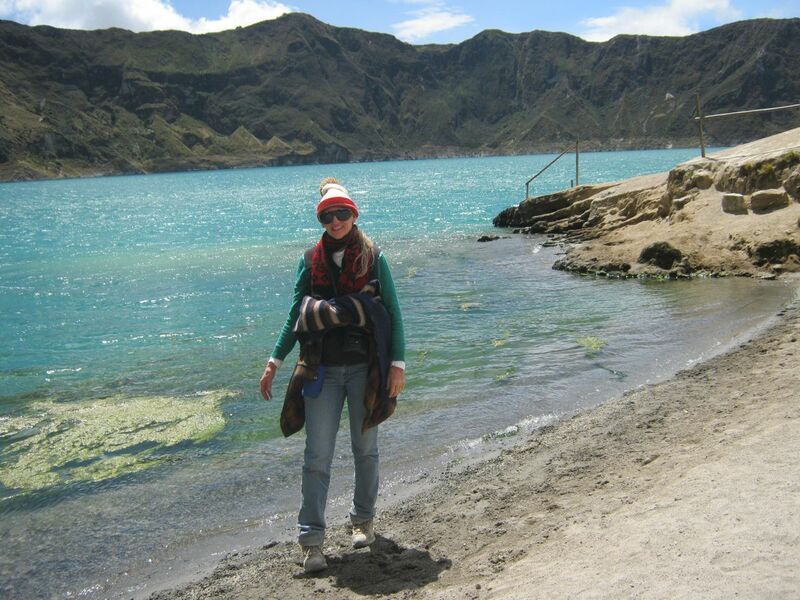 We managed to get there early enough on Sunday, April 21st, for Marco (who works for FEDICE) and Maria (his wife) to guide us to Lago Quilotoa. We didn't mention it in the post about San Francisco because it wasn't part of the focus of that post. Besides, we forgot the camera in the car and didn't get any pictures. However, even though the clouds descended shortly after we arrived, we knew we'd want to come back - and so would our family. When we told Marco we'd probably come back in July or August, he cautioned us about high winds. However, that was one of the only times Brayan could get out of school for three days in a row. Besides, I figured I could handle high winds better than rain. I'm a little wiser now - both rain and high winds are difficult for me to handle. We left on Tuesday. We had invited Lisa Renz, who also works for FEDICE to come with us, so we picked her up in Quito on our way. Also, Isabelle Tyrasa, a part-time volunteer for FEDICE, had gotten back in town on Friday and we thought she wanted to go as far as Latacunga to see her boyfriend. 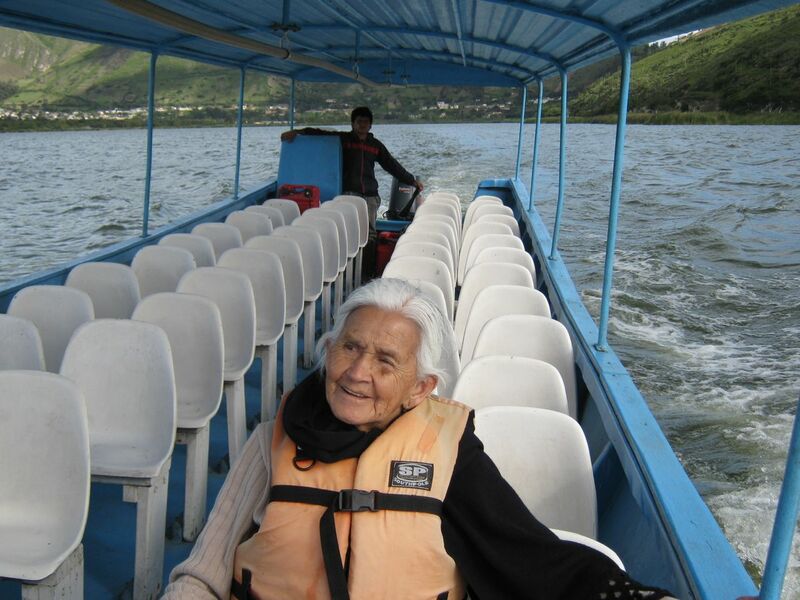 To our surprise and delight, she wanted to go to Lago Quilotoa with us and be dropped off at Latacunga on the way back. We had seven in all on the trip, a very nice group size. 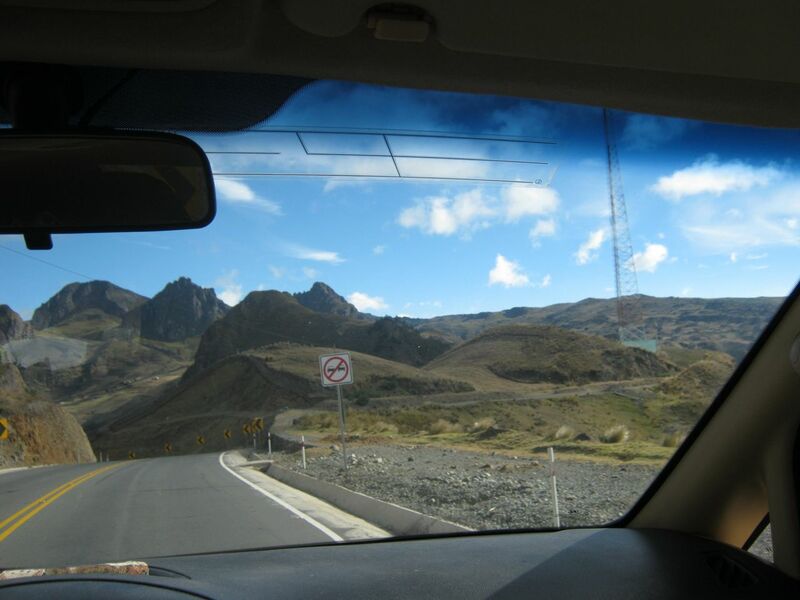 The drive from Latacunga to Laguna Quilotoa is really beautiful, and the road was excellent except for one small stretch. 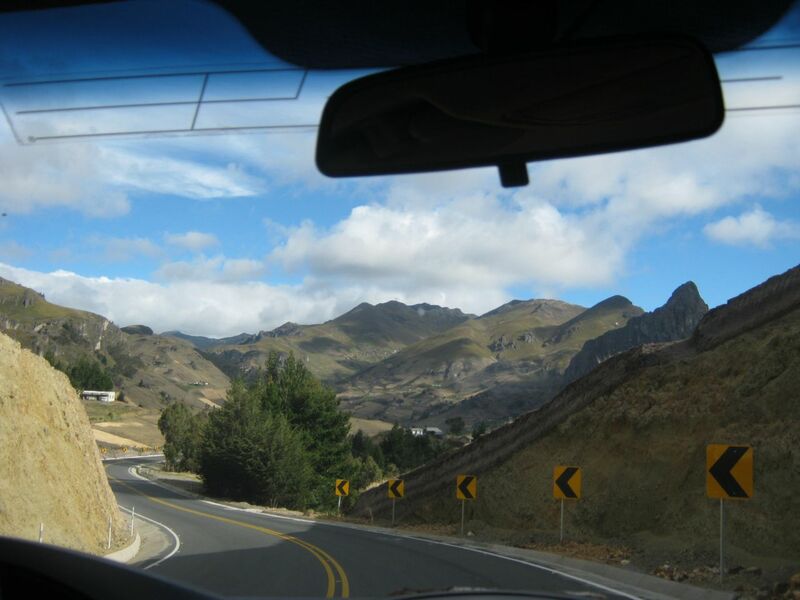 Due in part to the high price of oil, Ecuador has been improving infrastructure at a rapid rate during recent years. Part of that infrastucture, of course, consists of roads and highways. Many have been improved with new sewers, with asphalt paving instead of rocks or dirt, and with substantial widening. The government advertises that they're doing this to better unite the country. I would say that they are achieving that goal because it has gotten easier to get around in Ecuador than it was when we came here, only three and a half years ago. Lisa, who lived in Mexico for 44 years, says that the highways in Ecuador are much better than those in Mexico. In a way, it was surprising that this highway was so good. It wound through mountains that were sparsely populated. On the other hand, it was good to know that all of Ecuador was benefitting, not only the more populated areas. Many sheep were raised in this area because it was so high. We were stopped once or twice by flocks of sheep on the highways being moved from one pasture to another. 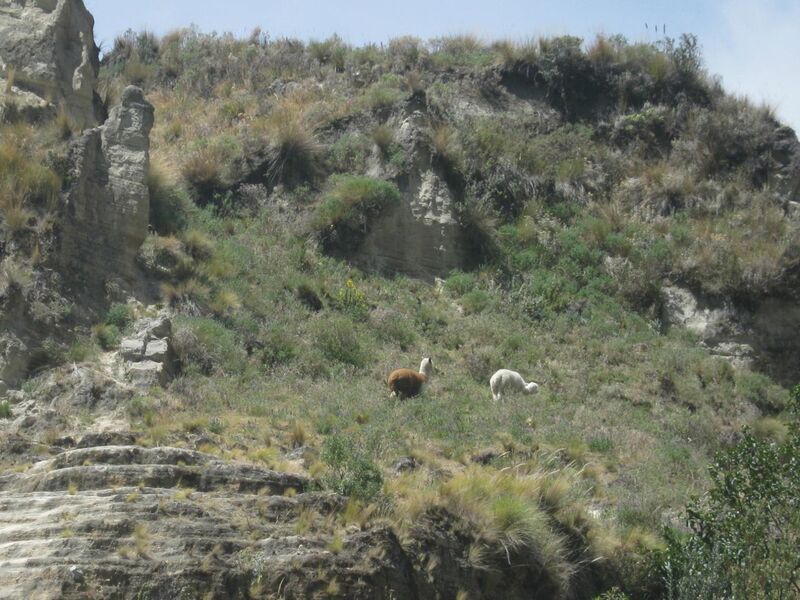 When we arrived at Hosteria Alpaca, we got another surprise that wasn't as pleasant as learning that Isabelle was going with us. The three rooms we had reserved were ready and waiting, but they were all upstairs. (Elevators are a rarity in Ecuador, especially outside the big cities.) Isabel let them know in no uncertain terms that she had specified two rooms downstairs with at least one room for sure when she made the reservations, but it appeared the hotel manager wasn't willing to try to make any changes. Marilyn had gone in before the rest of us and had talked to a family from Arcata, CA. She now went over to them and asked if they were staying downstairs and, if so, would they mind switching rooms with Marilyn and me. They were glad to do so. In fact, they were happy about it because the upstairs room had views in two directions, whereas the view from the room they vacated was only of the woodpile. If Marilyn was a man, we might say she had cajones. We just settled for saying that she was bold. After the room assignments were straightened out, we all walked to the overlook, though the sun was about to set. Lisa had broken her foot in three places in February and is just now starting to ambulate with a cane. Marilyn had assured her that the walk was "only two city blocks". By the time we got there, Marilyn had conceded it was more like three city blocks. Lisa said it was more like six. But it was worth it because the view was spectacular. 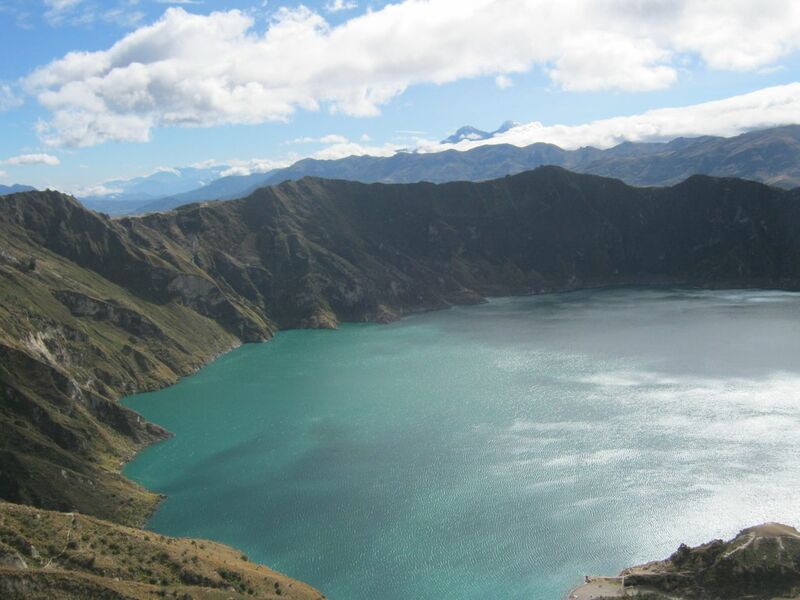 Lago Quilotoa is much like Crater Lake in Oregon, though smaller. 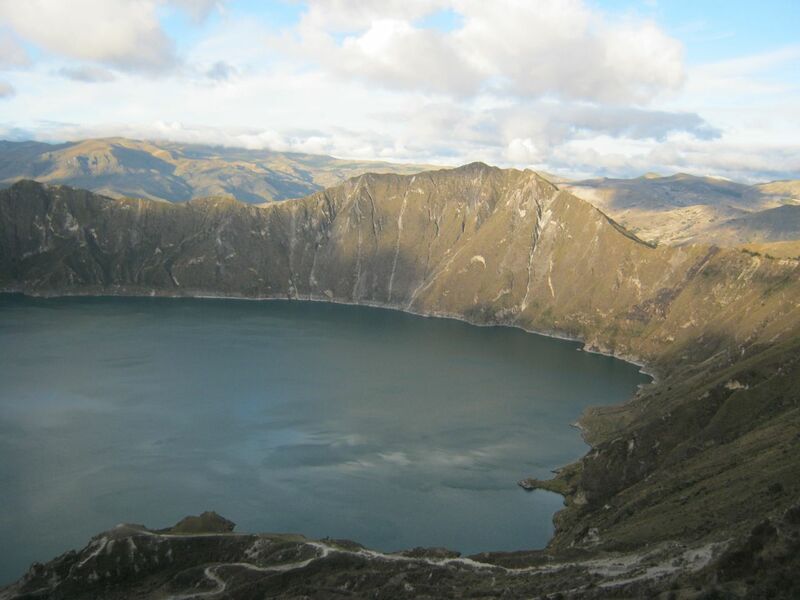 Lago Quilotoa is two miles across while Crater Lake is five miles wide and six miles long. 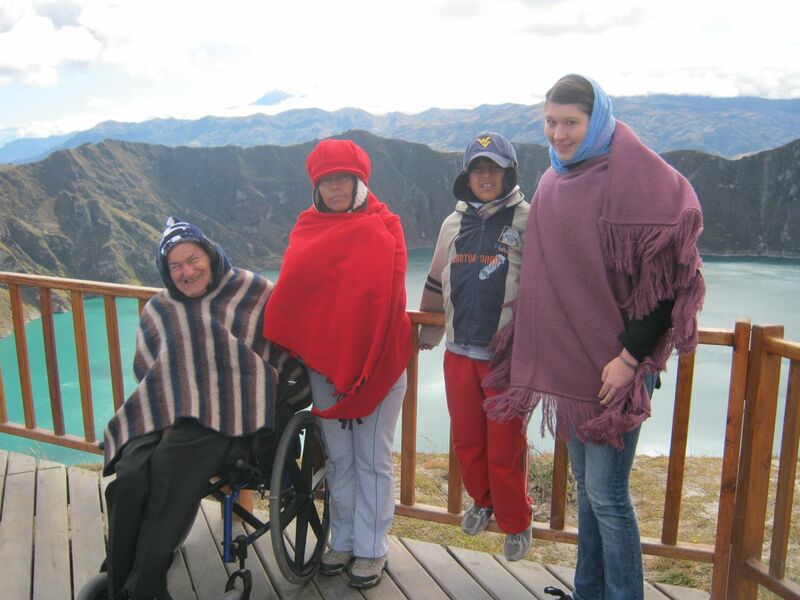 Crater Lake is 6,200 feet high, but Lago Quilotoa is 12,800 feet high, meaning that even though it's just south of the equator our group can attest that it's c-c-cold. The sun was just about below the caldera rim when we got to the overlook, making the water a dark blue. We battled the wind and cold for as long as we could (about five minutes) before heading back to our hotel. Marco certainly knew what he was talking about when he told us in April that it would be very windy in July! At the hotel, people were gathered around a wood burning stove and we joined in. We met people who spoke German, Dutch, Yiddish, Spanish, and English. I would have expected the "common denominator" language to be Spanish. It was English, though Spanish was a close second. We met some people who couldn't speak Spanish and marveled at how they could still get around Ecuador on the bus system. No doubt they were able to do so through the kindness of strangers. Most of the clientele were young - 20's and 30's. Most liked to hike. All got around on Ecuador's bus system. We were the only ones with a car. It was delightful talking to different people, especially for Lisa, who hasn't gotten out amongst people much since injuring her foot. We also enjoyed talking with the family who had switched rooms with us. Dad is a professor at Humbolt State University and all four children were very sharp. There was also a family of four from Germany. The children were about seven and nine and the parents told us they had all hiked up the 12 kilometers from the town of Zumbahua. Even they were surprised that the kids had done so well and didn't complain. For $20/person/day, we got a room, breakfast, and dinner at Hosteria Alpaca. All meals were served family style and we all sat at a long table. (Actually, since the hotel was full that night, we sat at two long tables.) We liked this because we could eat as little or as much as we wanted. Of course, the dinner conversation was lively and interesting. I sat by the stove after dinner until it was time to go to bed. That was definitely the warmest spot in the big, spacious lobby. When it was time to go to bed, Isabel tried to light the wood burning stove in our room before heading to her own. She didn't have much success. Man, oh man, were those sheets cold when we hit them! We used a feather comforter, the blanket supplied for our bed, the blanket supplied for the other bed, and my poncho. We both tossed and turned trying to get warm. Finally, I drifted off to sleep to the sounds of young people talking and laughing in the lobby. (The rooms weren't exactly soundproof.) I remember when I would have been one of those young people staying up, talking, and laughing. Sigh. Marilyn always needs to get up to go to the bathroom during the night. The first time she did so was pretty funny. Our room had three similar doors side by side, kind of like "Let's Make A Deal". It was very dark in our room. We had noted before going to bed that our toilet didn't have a seat on it and Marilyn remembered that little detail. She found the bathroom (door #1), found the light switch, and turned it on. No light. She thought, "Maybe the room light needs to be on before the bathroom light will work." Feeling her way from door #1 to door #3 (the entrance to the room), she found the room switch and flicked it on. Nada. Okay. She'd have to go to the bathroom in the dark, with no toilet seat. She started back to door #1 but miscounted and opened door #2. Door #2 was a fairly deep closet and she hit her head on the back wall. Fortunately, she found her way out and won the prize for entering the correct door. I was blissfully asleep during this episode. The second time Marilyn went to the bathroom, there was no water. So she had to adjust to that (successfully, I might add) in the dark. We learned later that they turn the water and electricity off every night. Trouble is, they don't warn the guests about it ahead of time. We reminded ourselves that it was $20/person/night with two good meals and a comfortable bed. For that price, why should we expect to have a toilet seat, continuous electricity, and continuous running water? The sun was shining after breakfast on Wednesday, so I asked Marilyn to take me back to the overlook. The rest of our group came, too. It was very windy again. I had asked another guest if it was windy in the morning, so the wind was expected. My plan of reading at the overlook was blown away. But the view was again spectacular. This time, with the sun shining down, the water was emerald green. A few minutes later, Victoria, Lisa, and I were taken back to the hotel where we would hang out until lunch. 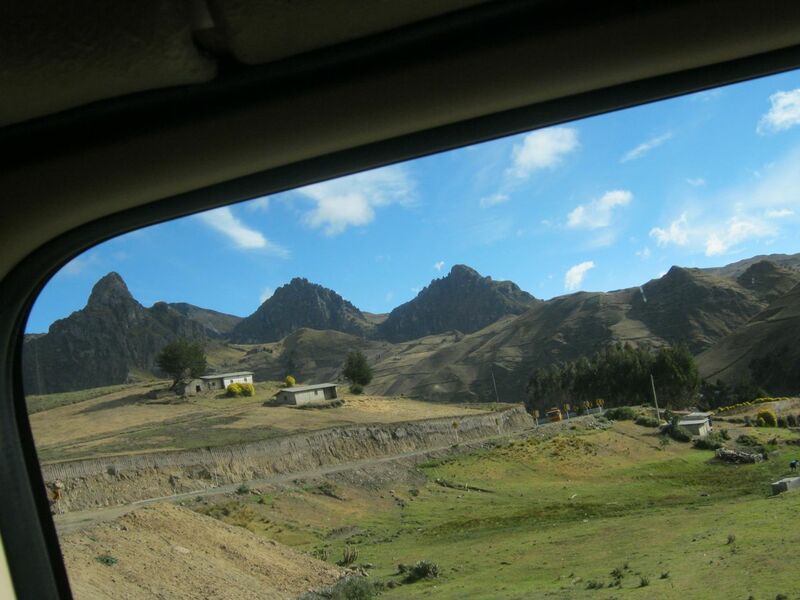 Marilyn, Isabel, Isabelle, and Brayan were going to hike the (steep) 1,300 feet down to the lake. I read Lone Star, a history of Texas, while Lisa and Victoria talked and took a few naps. At one point, Lisa was lying down on the couch when the resident puppy came by and licked her face. She shot up faster than I could imagine, causing me to laugh so hard that I almost dropped my book. Meanwhile, the hikers enjoyed the excursion down to the lake and back up (at least Marilyn and Isabel did). 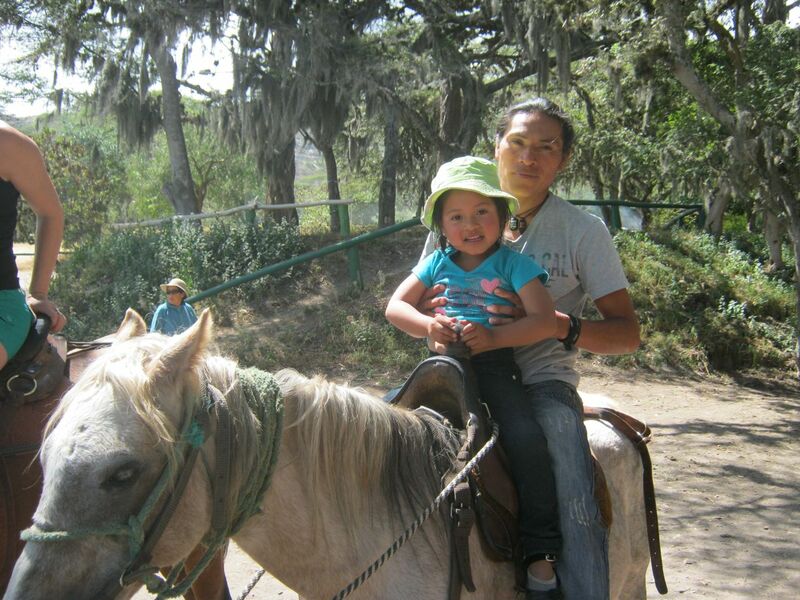 Brayan wanted to take a horse back up and Isabelle was a bit nervous about sliding off a cliff. This time of year, there's not a lot of rain, so there was a lot of blowing dust. The wind didn't die down just because they were below the rim of the caldera. At times, the footing was not that great and, unbeknownst to us, Isabelle was afraid of heights. But she was a trooper and didn't turn back. Once down, the four walked and played along the lake. The water was even more beautiful than it was from the overlook. It was crystal clear, too. At one point on the way back up, they had to use a fixed-rope to traverse a place on the caldera wall that was covered with sand because of a recent landslide from the top. By the time they got back, they were covered in dust. Poor Isabelle had red eyes and a cough from the dust. She still had red eyes the next morning, though her cough was not quite as bad. 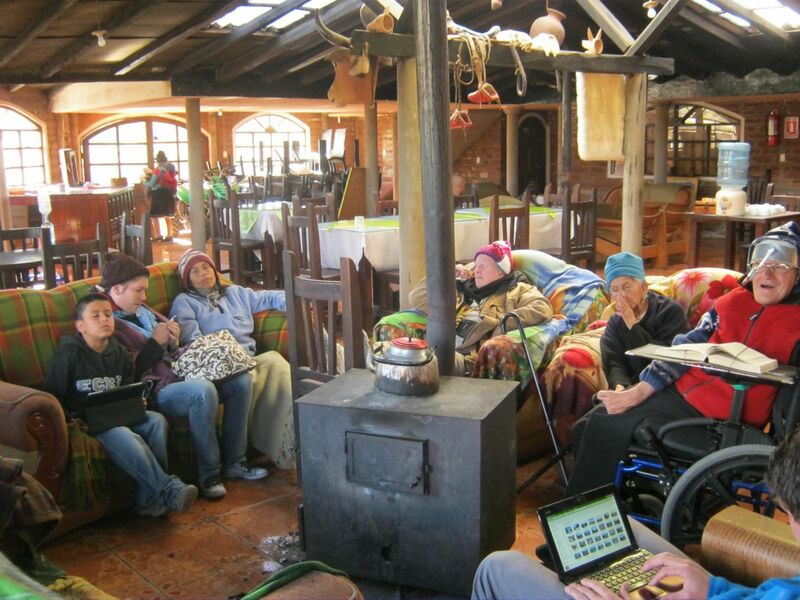 We were all content to sit around the warm stove and laze the afternoon away after going to another hotel called Hostal Pachamama for lunch. There were more people sitting around the stove in the afternoon. I was sitting next to a guy name Leon and talked to him a little bit. He was a grad student from UT-Austin (stomping grounds for Marilyn and me) in Latin American Studies. He was down here doing his thesis on studying the effects of a solar installation on a small village that had no electricity. 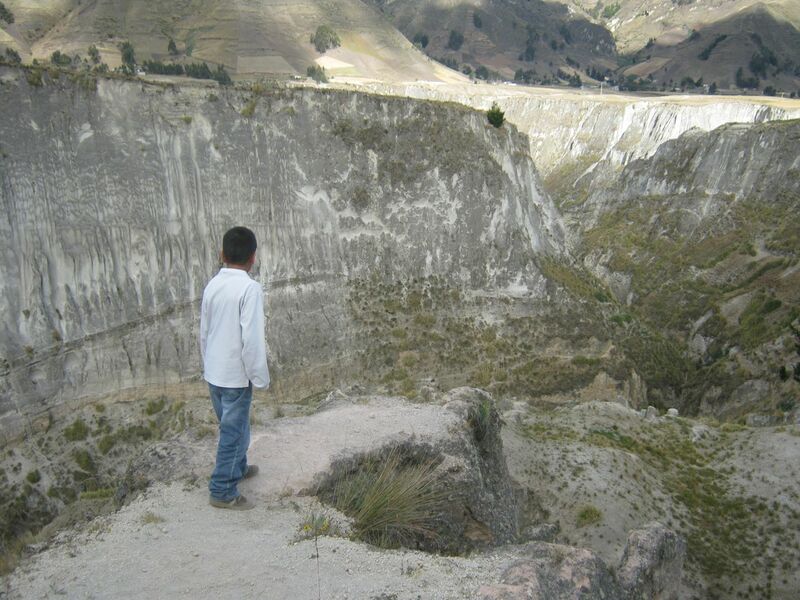 Since that work had been completed, he was traveling around Ecuador and climbing volcanoes. I asked him to please send me a picture from the top of Imbabura, "my mountain", if the weather was clear the day he attempted to climb it. 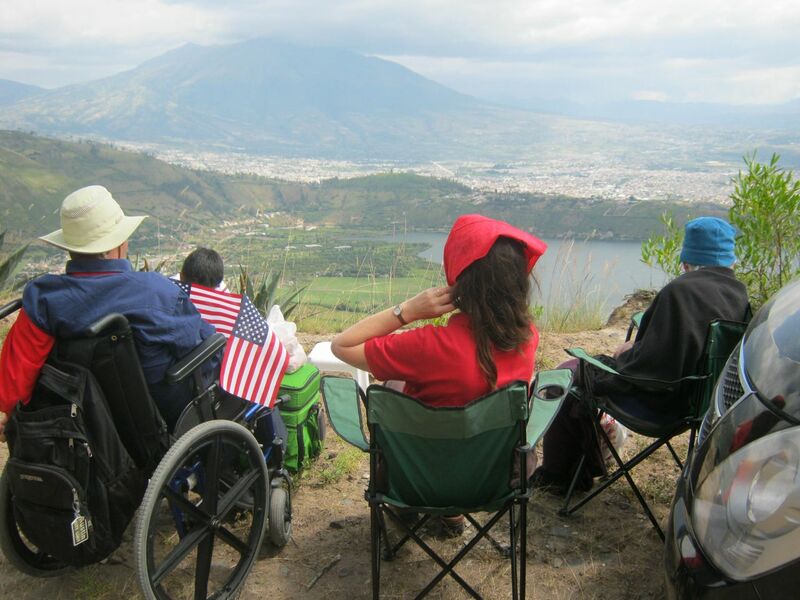 I'm thinking of putting two pictures side by side - a view of Imbabura from Otavalo, and a view from the top of Imbabura. When we were ready to go to bed, Lisa asked the hotel staff if they could light the fire in the stove in her room. Isabel made the same request. Marilyn and I thought that was an excellent idea, so we asked, too. They lit the fire with gasoline. No wonder Isabel had been unable to get our fire going the night before! After the gasoline fumes evaporated, we were nice and comfy. Too bad we didn't think of asking the hotel staff the night before. There were no nocturnal mishaps this time, though we were without electricity and water for most of the night. On Thursday morning before breakfast, Marilyn tried to start the car. We had been having trouble with it stalling and had taken it in for service. When we got it back, the stalling appeared to be fixed, but there were a few times when it didn't start on the first crank like it had usually done before. That morning it wouldn't start at all. Marilyn came back in and asked Leon if he knew anything about diesel cars. He said they usually had a heater to warm up the motor in cold weather. So he and Marilyn went back out to look for a heater with a plug. The idea was that they could borrow an extension cord from the hotel. They didn't find a plug, and came back in to eat breakfast. We were pretty confident that it'd be okay once the day warmed a bit. Unfortunately, it was cloudy, except for a few moments of sun. Marilyn tried again after breakfast, then started packing things into the car. When it still wouldn't start, she asked the hotel manager if the lady could call someone to give us a pull. We figured that maybe it would start if it was rolling downhill. She called her husband and he came over with several men. As they were all standing around looking at Billy Bob ready to push it up the hill to the point where it was facing downhill, Leon decided to try to start it one more time. And it worked! Isabel said the car only needed a bunch of people standing around. Marilyn left Billy Bob running while we all loaded up and we quickly headed out. A funny thing was that the men didn't go back to where they had come from. Instead, they all went into the hotel. They had been offered a free breakfast for their "hard day's work" for helping to push our car. We took three of the backpackers/hikers with us. They would have had to wait for the 1:00 p.m. bus and we left at 9:40 a.m. One of the guys said that it was certainly more pleasant than the constant noise of a bus's audio or video system. I'm not sure he had a better view of the scenery, however, as he was squeezed into the back of our van. 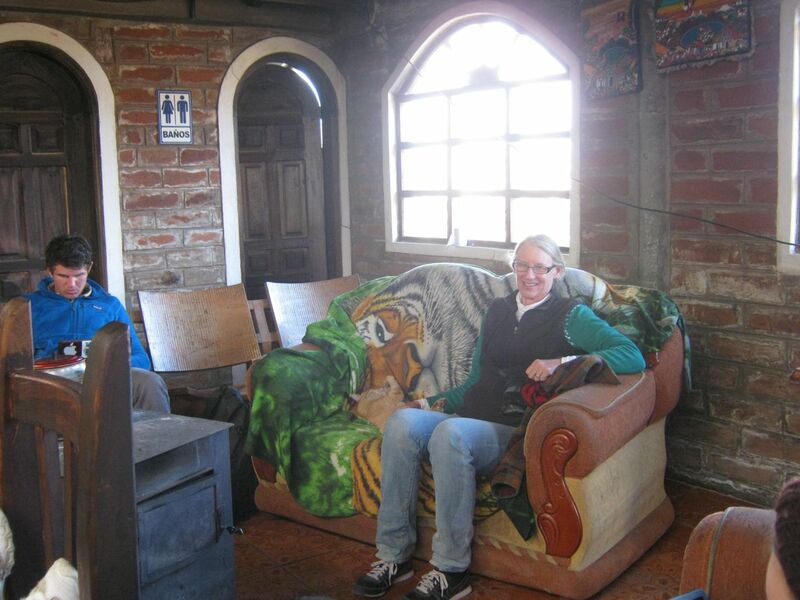 We dropped the two backpackers/hikers from The Netherlands, plus Isabelle, off at the bus station in Latacunga. 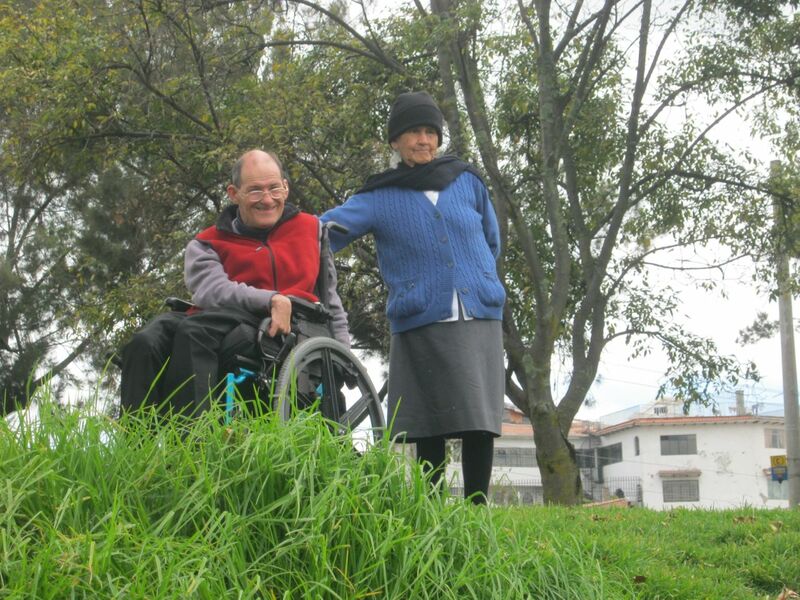 Isabelle was meeting Marco Garzón, a FEDICE staff member, who would take her to where she needed to go. Then we dropped Leon (the mountain climber) at Machachingi, just south of Quito, before having lunch at La Avelina restaurant, which is also just south of Quito. Blanca and Luis introduced us to this restaurant once and we've stopped there often when traveling south of Quito. After lunch, we dropped Lisa at her house and headed home after our nice short trip. Loved the photos in this. So good to see you all enjoying yourselves. On July 20th, we got up early to get dressed and go to church by 10:00 a.m. But July 20th was a Saturday you might say if you have a calendar nearby. True enough, but Maria Augusta was being confirmed in the Catholic Church, like millions of others who are confirmed in various religions each year. 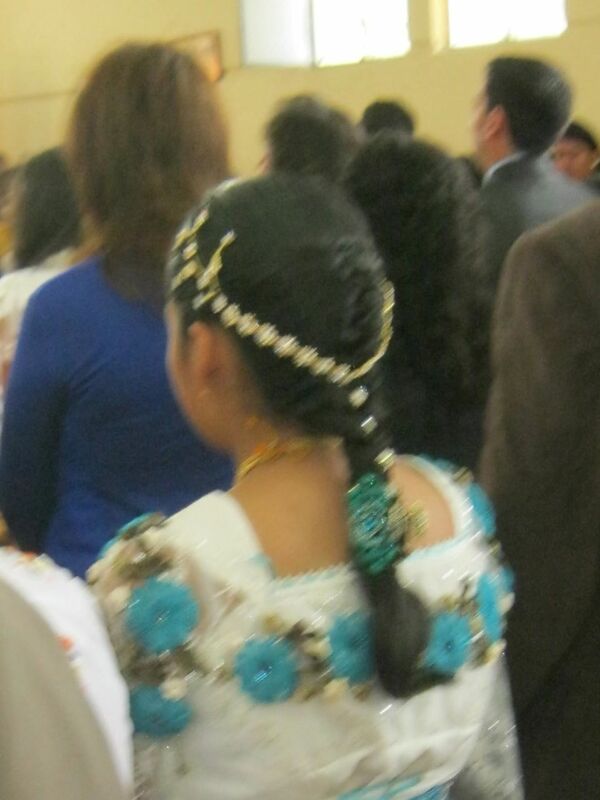 Latin Americans tend to celebrate the confirmee much more than I was celebrated when I was confirmed, some 50 years ago. They hold dinners and parties and give gifts when they can afford such things, or by going into debt. When I was confirmed, I settled for being proud that I was a "member of God's army". Maria Augusta, known to us as Augusita, was beautiful in her cream-colored dress. I was almost as proud of her as her parents. That's because I often refer to her as the daughter I never had. Her padrino (godfather) was a very handsome man from out of town that I had never met. 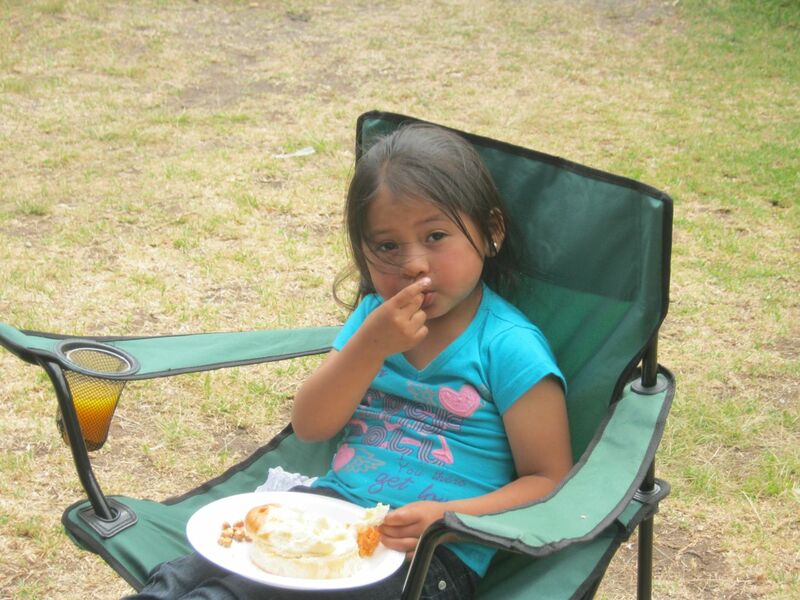 If I couldn't have been her padrino, I was happy with the choice her parents, Cesar and Luz, had made. Besides being a nice man, Augusita and he made a made a very good looking couple as they processed down the aisle with the other confirmation candidates, padrinos, and madrinas. During mass, I was sitting with Marilyn, Isabel, Brayan, Victoria, other family members, and Juleide. Juleide is the granddaughter of Nancy, one of the people who works for Luz and Cesar at their restaurant. 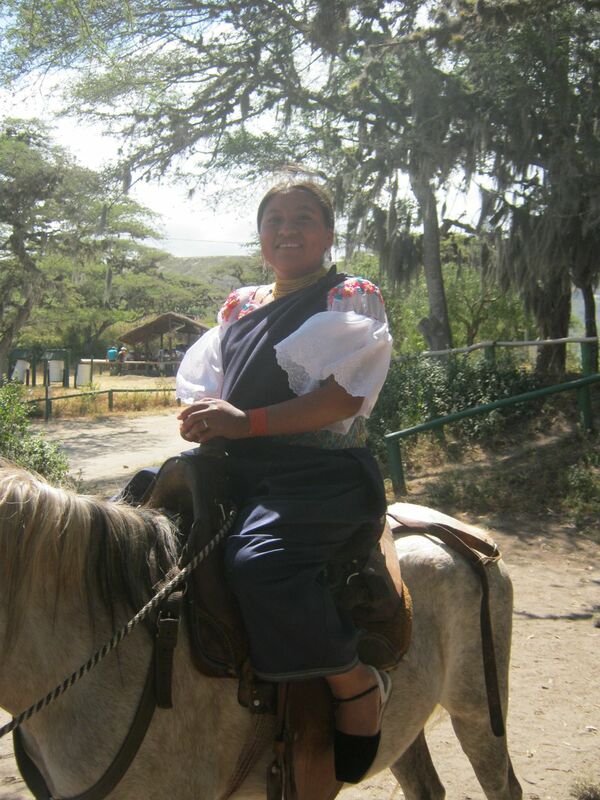 Juleide lives in the Oriente (eastern Ecuador), but often visits her grandmother in Otavalo during the summer. The two 13-year-olds, Juleide and Augusita, have become good friends. At one point during the mass, I began crying. Juleide was sitting beside me and asked if I was sad. I explained that, no, I was happy. She gave me a funny look, like, "Another crazy gringo." Sometimes, when I'm in church, be it Protestant or Catholic, a feeling of what I can only describe as well-being descends over me, even though I don't consider myself a particularly religious person. It baffles my somewhat analytical mind, but I've learned to go with the flow. I start thinking about the scores of good and loving people in my life and how my life has evolved, and can't help but be overwhelmingly thankful, God or no God. When mass was done, everyone gathered outside the church for greetings and photo opportunities. Then we walked or drove to the restaurant at which we would have the dinner and a fiesta in honor of Augusita. The restaurant was Fusión, one of our absolute favorites in Otavalo. 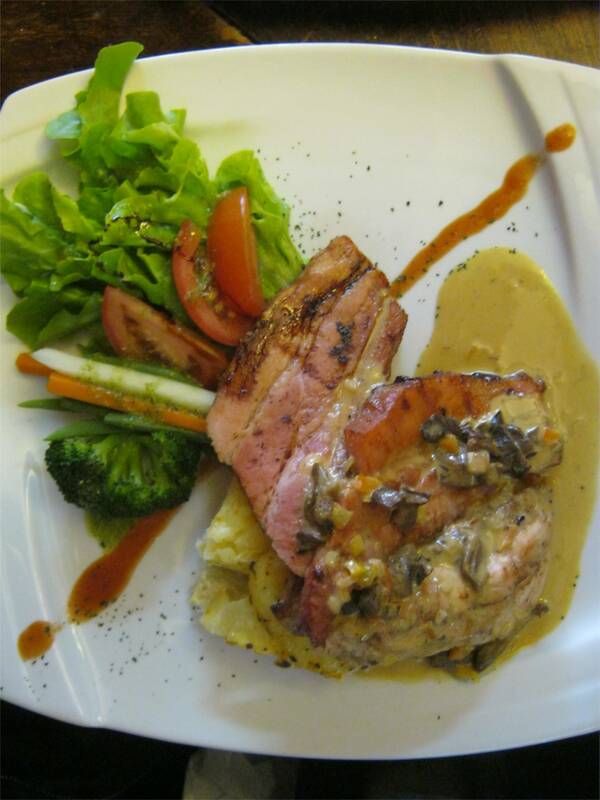 As the name implies, the cuisine was a fusion of different tastes from all over the world. Oh, it was good. We had a private party, consisting of 40-50 people, so the waitstaff was only concerned with us. 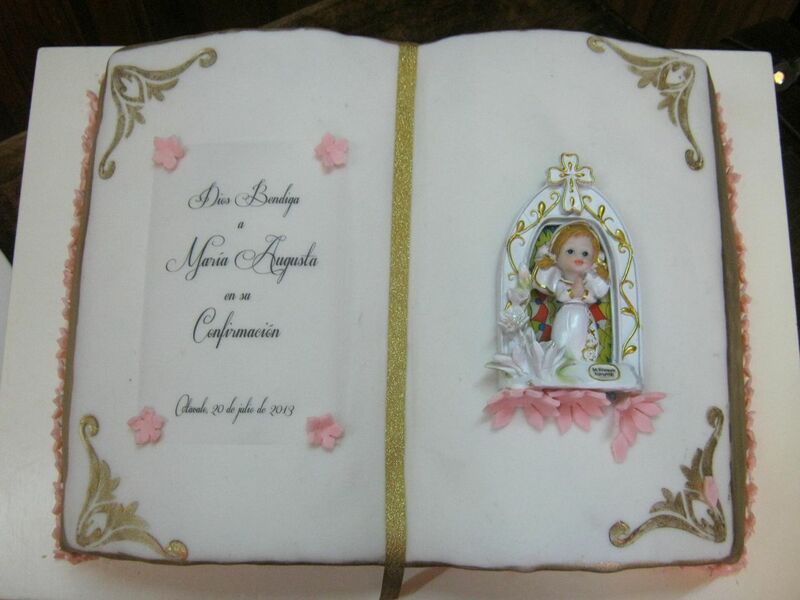 The cake was unique. Neither I, nor anyone else, had ever seen one like it before. It was shaped in the form of an open Bible, complete with a gold "place marker" ribbon. The "page edges" were also gilded. I asked Luz who made it and she told me that a neighbor across the street made it. Remarkable. Such artistry. I've never had a Bible that tasted so good, either, even during my chewing stage when I was an infant/toddler. After we ate, a two piece band came to play and sing for us. Of course, the dancing started soon after. One of the songs they sang had a refrain that went, "Es mi niña bonita" (It's my pretty little girl). Looking at Augusita and singing along, the tears started flowing again. What can I say? I've always been a sentimental softie. A few days later, Marilyn gathered the best of the photos she had taken that day and made an album for Cesar, Luz, and Augusita. They were thrilled. Backtracking a few years, I met Augusita when she was still ten years old. It was at a large family gathering where there were many, many cousins to meet. The other cousins politely said "Hola," and moved away from me for the rest of the evening. Or, their eyes got large and they barely managed, "Buenas noches," before scurrying away from that weird guy in the wheelchair. Not Augusita. She looked me in the eye, took my proffered hand, gently shook it, said "Hola," and made an effort to understand my reply. I immediately felt a connection to her. That's why I refer to her as "the daughter I never had". In my eyes, Augusita is beautiful inside and out. That daughter is present for me now, even though reality says otherwise. 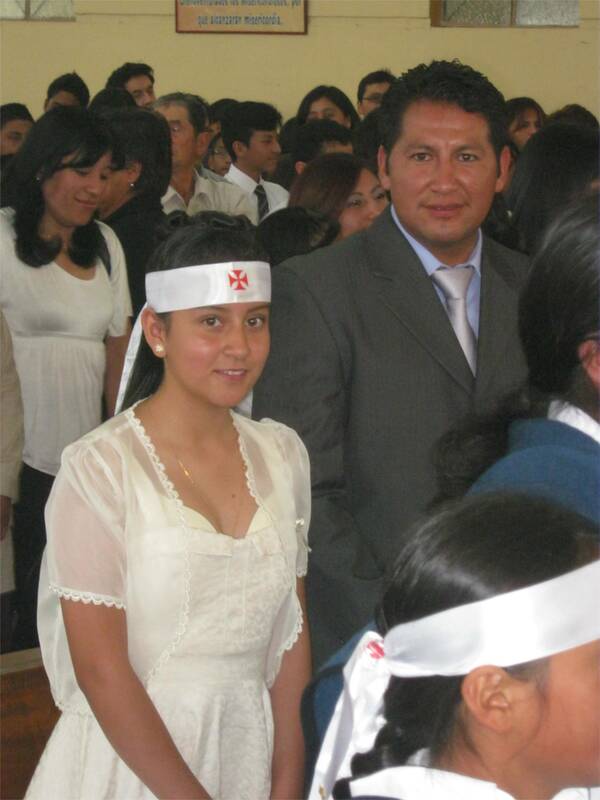 Augusita received several more blessings the day of her confirmation - a blessing from the church, the blessings of loving family and friends, and the blessings of fun and camaraderie. I, too, received even more blessings to fill my life, not the least of which was seeing my spiritual daughter shine on a special day for her. When Marilyn was growing up, she didn't receive very much in the way of career counseling. Her mother once suggested that, since Marilyn liked the outdoors (walking, cycling, hiking, backpacking, etc. ), she might want to think about physical education as a career so she would have summers free to do all those things. Marilyn took that advice to heart, receiving a Bachelors, Masters, and finally a Ph. D. in one form of physical education or another. When Marilyn switched careers in later life, she went through an interview process like most people. Only, this process was designed for her to learn about various jobs, not necessarily to seek employment. Once she found a field that was a good fit for her, then she could transform her interview process into one of obtaining employment in that chosen field. Anyway, that lead up was to point out the fact that, since she graduated with a Ph. D. in a career that really didn't suit her, she has always believed in career counseling at a young age. We chose not to have children. Therefore, there was no "Take Your Child To Work Day" for us, which is a subtle form of career counseling. We would have taken our nieces and nephews, but they lived too far away. The idea of a child cold calling someone to set up an informational interview, as Marilyn had done when she changed careers, just didn't fly. We now live with Brayan, an eleven-year-old, and we can't help but hope he'll have a more prosperous life than most of the rest of his family have had. Most of them have been very poor. 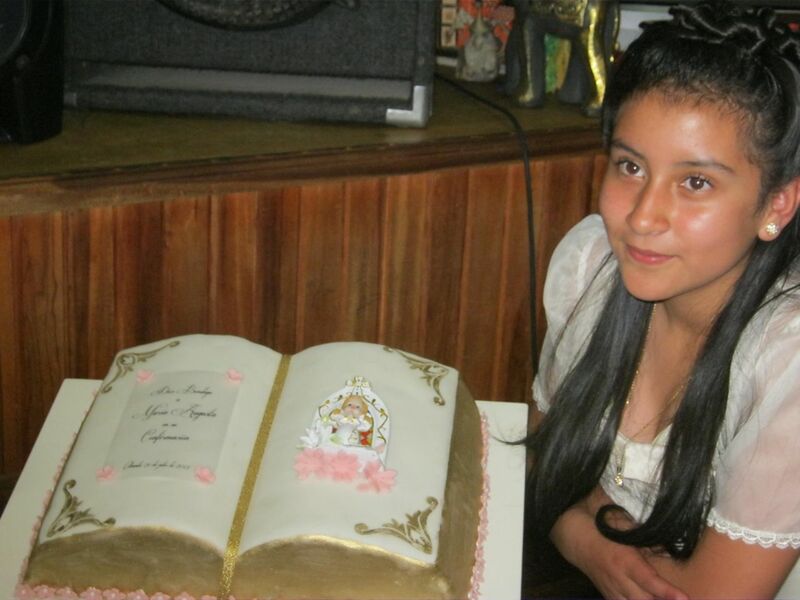 There is also Maria Augusta, a thirteen year old cousin of Brayan's, whose future we also care about. Marilyn's parents and my mother instilled in us the dream of going to college, though none of them were able to provide much in the way of career counseling. In fact, for Marilyn, NOT going to college was NOT an option. The same was true for my brother. My mother didn't know if I'd be able to go to college with my disability, so she didn't push me as hard. But I certainly knew that going to college was likely the only way to make a success of my life. 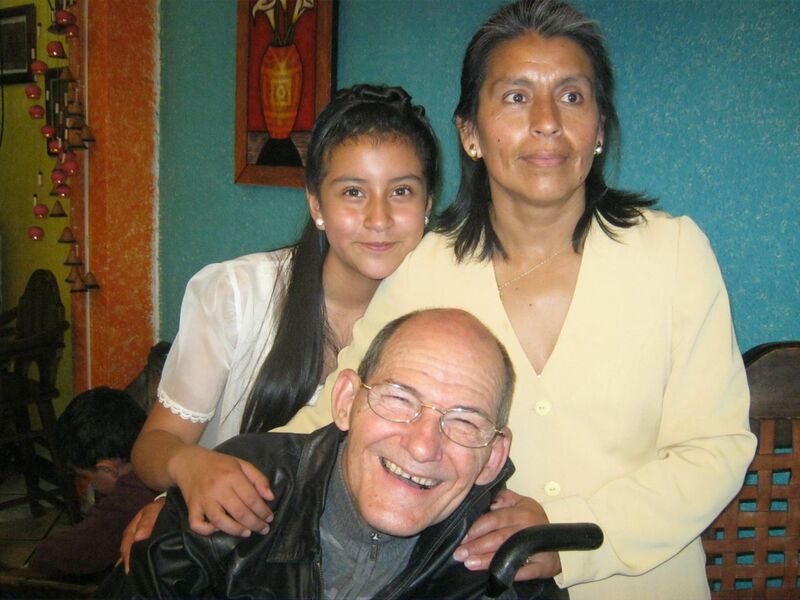 In the same way, we encourage Brayan and Maria Augusta to attend college in the future, be it in Ecuador or, if they can be allowed into the country, the United States. Brayan likes science and Maria Augusta wants to be a doctor. Whether those likes and desires change or not isn't what's important. The important things are for them is to have enough self-esteem to dream big and the ability to obtain the tools that will help them succeed. One of those tools, believe it or not, is the ability to speak and understand English. Certainly, not all good jobs in Ecuador require the ability to speak English, but many, many do. And, if one or both of them decided to attend college in the United States, English would be a must. Fortunately, we have enough resources to help enroll both children in English classes. The parents also pay part. We feel this insures that it's something that both the children and parents want to do. Recently, another opportunity for a little career counseling came along. 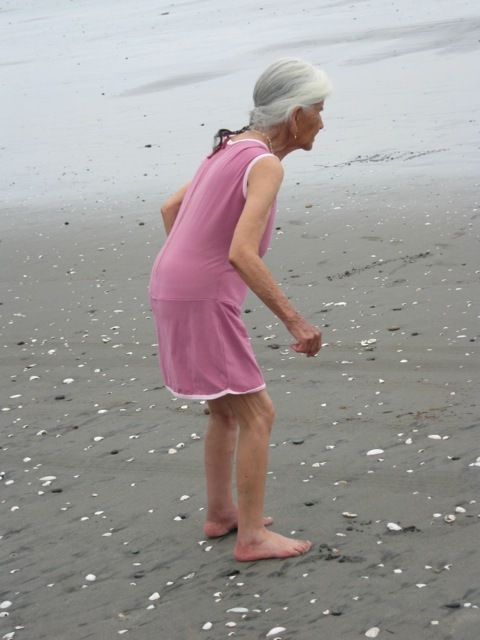 Through the internet, I happened to stumble upon a new hiking partner for Marilyn, Elaine Keane. We've all become good friends. 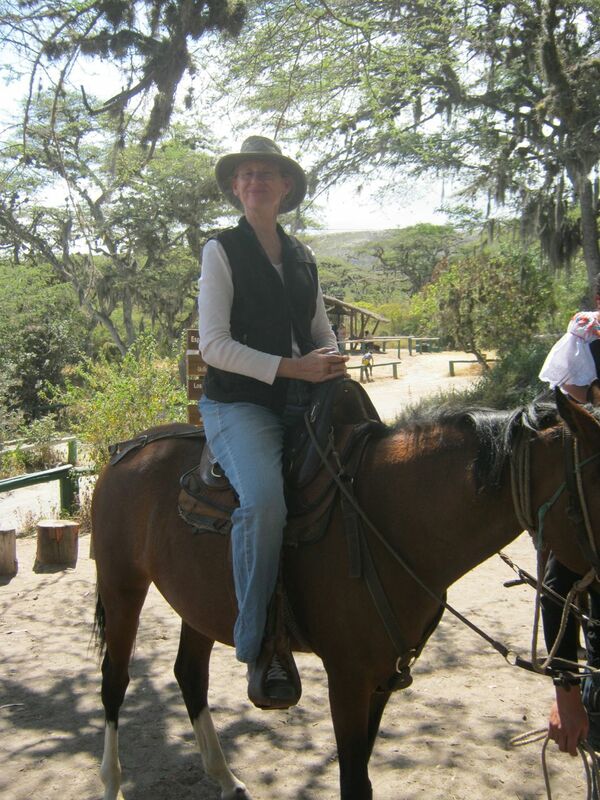 Elaine lives in Maryland and works part of the year in Ecuador. She is an occupational therapist. 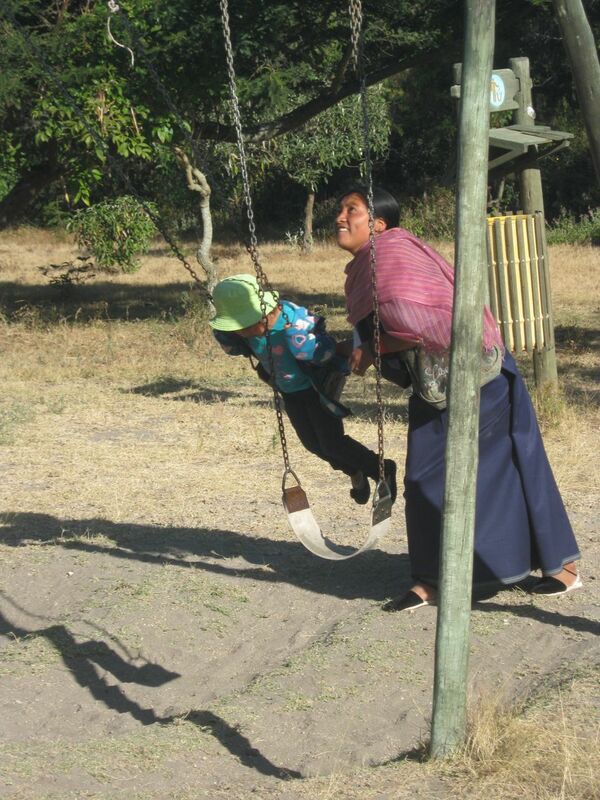 This year she set up a non-profit clinic in Ibarra called CRECER. She sees clients from infants to adults. From the first time they went hiking together, Marilyn thought about asking Elaine if Brayan (and, later, Maria Augusta) could observe her work one morning. "Of course," was Elaine's answer. We finally had a chance to do just that on July 17th, only we brought three children instead of two because Maria Augusta's friend Juleide was visiting from eastern Ecuador. Elaine first gave us something to read explaining why occupational therapy looks like play to those who don't realize how it is developing necessary skills in clients. The three children got to see and interact with a 1.5-year-old boy with CP (I think), a 2-year-old girl with Down's Syndrome, a young man with a traumatic brain injury, and an older man with a traumatic brain injury. 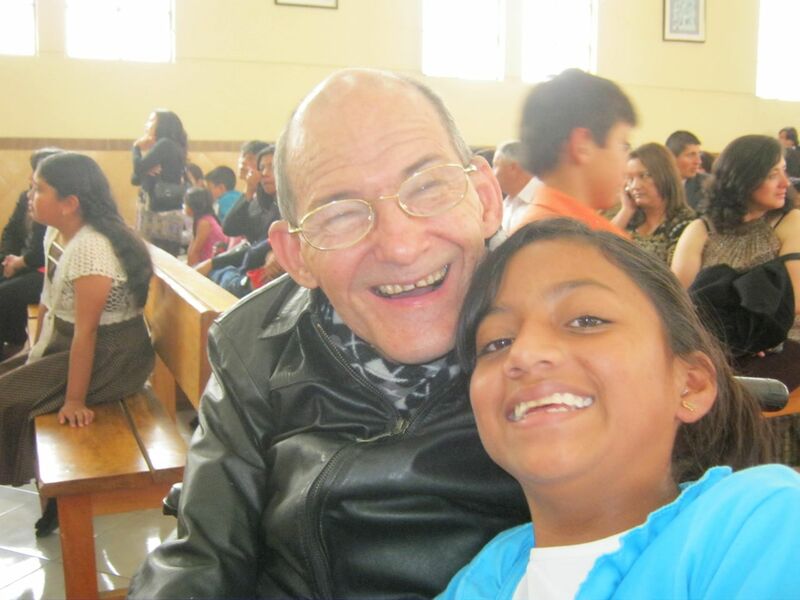 Brayan, Maria Augusta, and Juleide are comfortable around me, having had time to get to know me. I was curious to see how they'd react with these "new" people with disabilities. They had no problems at all. I think they all fell in love with the sweet little 2-year-old girl. Marilyn and I don't think the three children we brought to CRECER will suddenly change their minds about what they want to do when they grow up. But they've now had an opportunity to peek into a real profession. We hope there will be other opportunities to see what professionals do before they decide what they want to do with their lives, whether those opportunities are presented by Marilyn and I, or presented by someone else. 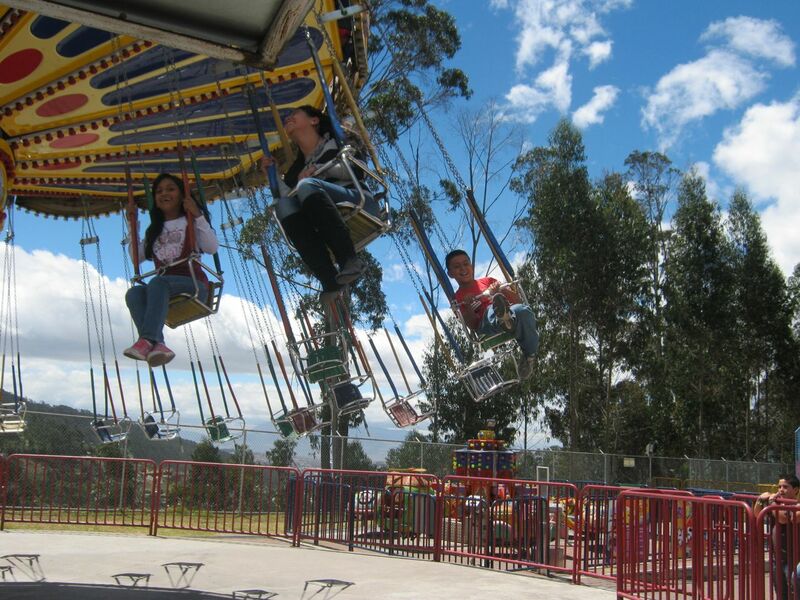 One of the things we wanted to do during our Fun Month was to take Brayan to Volquano Park, an amusement park in Quito. We hadn't taken him there in almost three years, so he was really excited about the idea. We were fortunate enough to pick a date when Maria Augusta, Brayan's cousin, and Juleide, a friend visiting Maria Augusta, could come. With three kids near the same age, they could hardly help but have a good time. When we arrived, the day was beautiful. 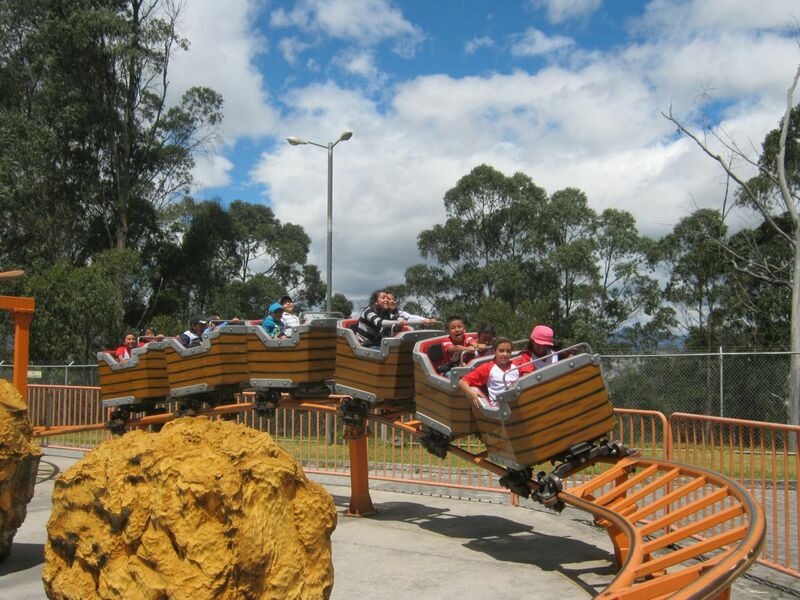 It would have been a perfect day to ride the Teleferíco, a gondola that goes high, high up the slopes of Volcano Pichincha, to the west of Quito. (The entrance is next to that of Volquano Park.) However, we didn't think we had time to do both and knew the kids had their hearts set on Volquano Park. We bought a $30 ticket for the three and had $10 tacked on as a promotion. So the kids had $40 worth of rides among themselves. The "ticket" was actually a card with a magnetic strip. 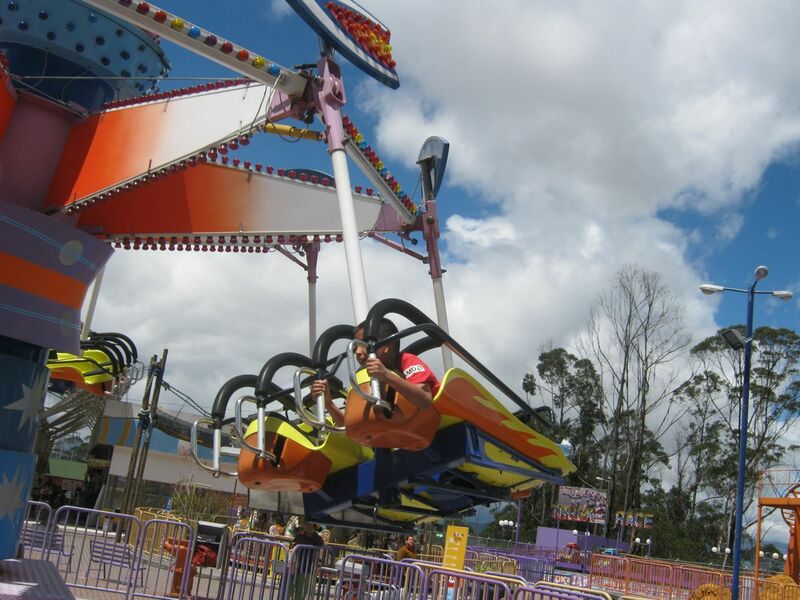 Each ride operator swiped the card in a device at the ride, once for each person wanting to ride. After the card was swiped, the operator told the patron(s) how much was left on the card because different rides cost different amounts. We told the kids to decide among themselves which rides they would do. Isabel, Victoria, Marilyn, and I simply followed them around. It was interesting watching Brayan, Maria Augusta, and Juleide work out what they were going to do next. Sometimes they wanted to do different things, but they always came to an agreement. They never did anything alone, though we told them that was possible. 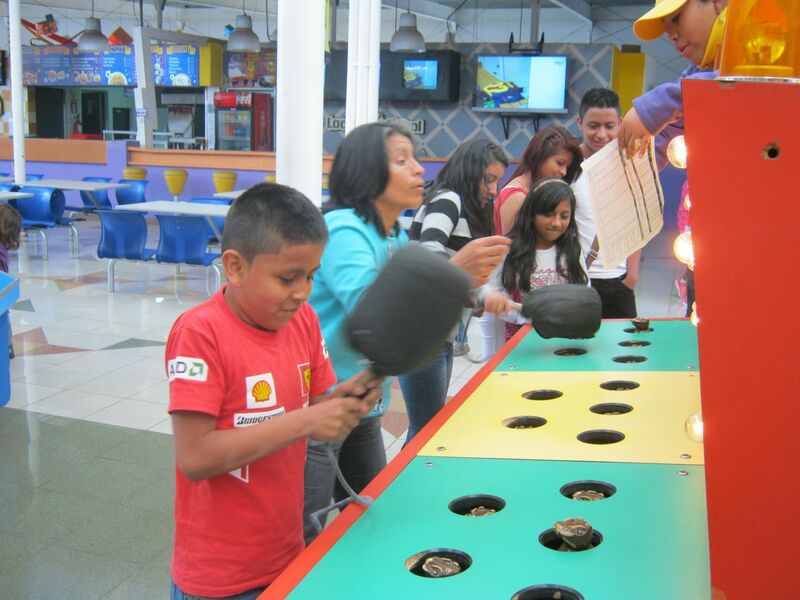 The only time one was left out was when only Brayan and Maria Augusta played Whack-A-Mole because there was only enough left on the card for two people to play. They even insisted Isabel and Marilyn join them on one ride. After they were finished, it was my idea to eat there instead of getting in the car and going to KFC or a pizza place. Bad idea! First, the concession stand advertised things they only had on weekends, like the hamburger I wanted, or the fried chicken most everyone else wanted. About the only thing they had were individual slices of pizza, so we got that. Eeeew! It was covered in ketchup instead of tomato sauce, the cheese was almost non-existent, and the dough could only be described as having the consistency of Wonder Bread. Even the kids noticed, unrefined palates that they might possess. Next time, we head for KFC or Papa John's! But that was the only blemish on an otherwise delightful outing. We do tend to have good trips in Ecuador. Sometime ago our goddaughter Natasha told her mother, "You know. I wish Marilyn and Glenn would take me somewhere far away." 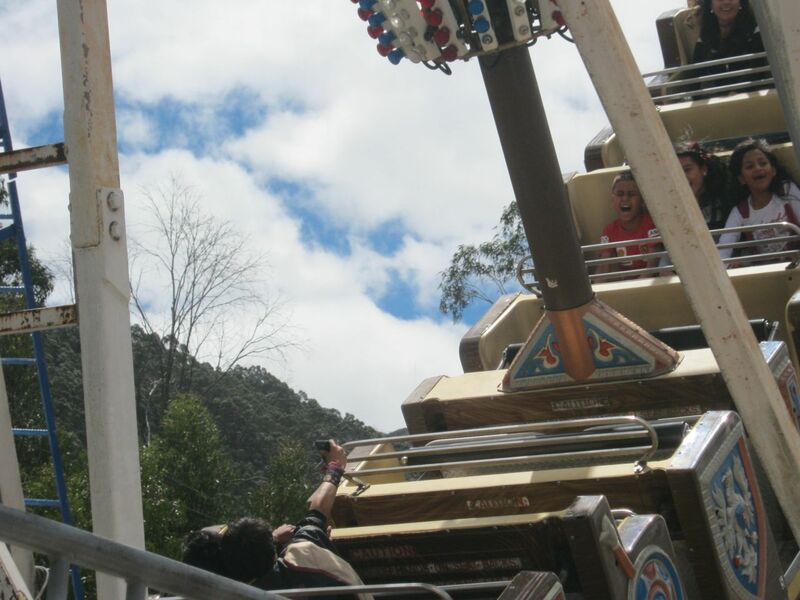 Apparently, almost five-year-old Natasha was already getting bored with going to our tried and true spots like Rosalie Suarez for ice cream, Lago Yahuarchocha, and Lago Cuicocha. This little girl has definite ideas about what she wants out of life! So we decided we'd take Natasha, her parents, and Elaine Keane camping Saturday and Sunday. 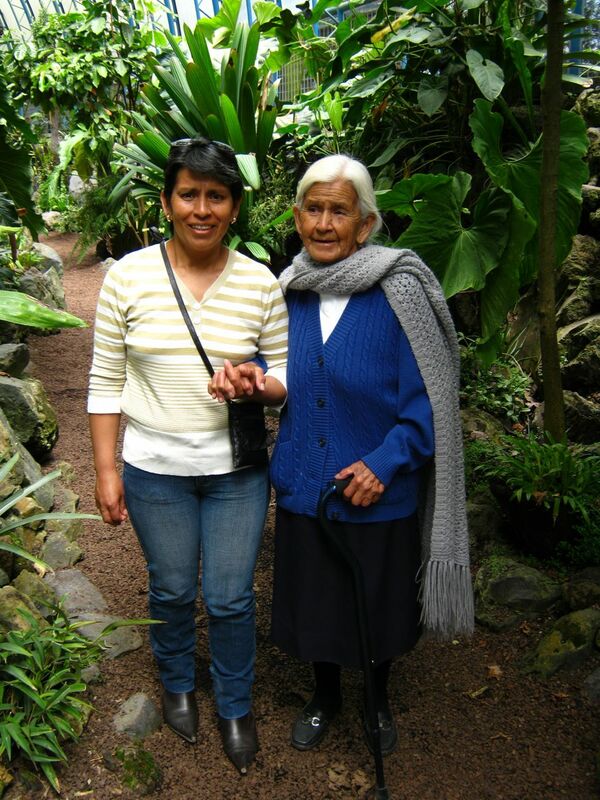 Unfortunately, Blanca Puma, Director of FEDICE, lost her mother to lung cancer on Friday. 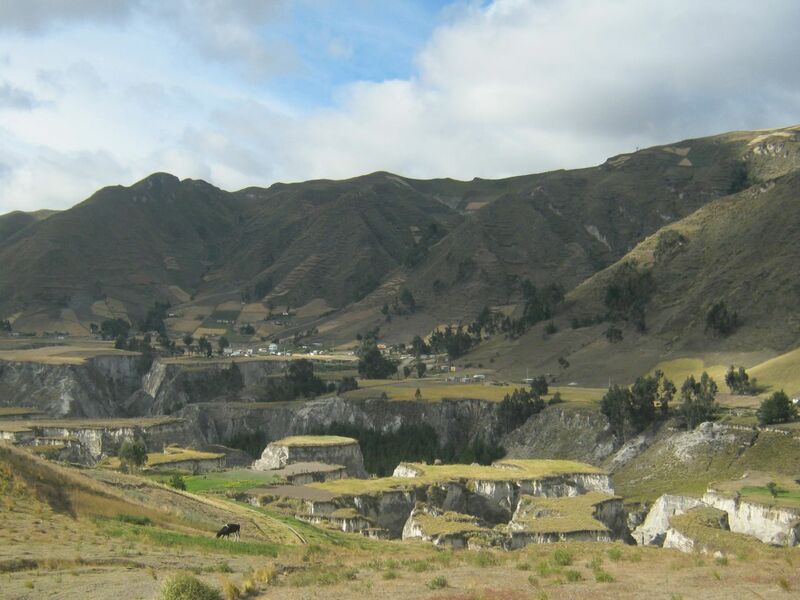 In Ecuador, a person is usually buried the day after they die. 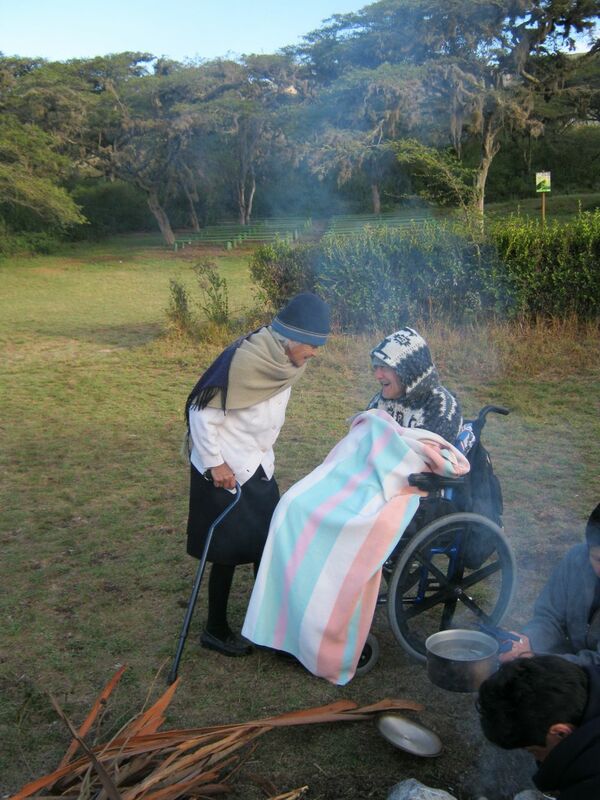 That meant we'd be at Fabiola's funeral in Quito on Saturday instead of camping in Parque Jerusalem. All our friends understood perfectly when we called to change the overnight camping trip to a day trip, especially because all but one knew Blanca very well and Natasha's mother, as well as Isabel, had both worked with Blanca in the past. 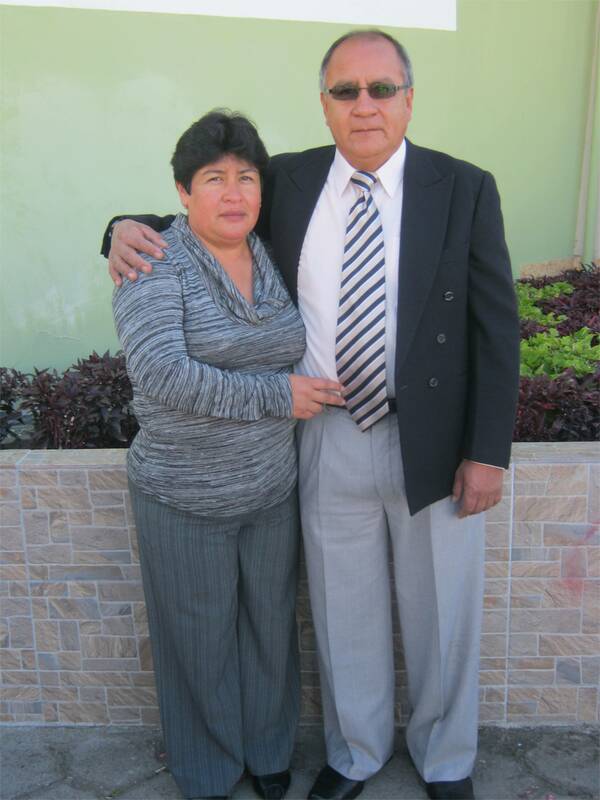 Lucila and Elias, Natasha's parents, got to our house with Natasha at about 10:30 a.m. on Sunday. Elaine Keane, Marilyn's hiking buddy from Ibarra, got to the house earlier. Even though it wouldn't be a camping trip as originally planned, we were rarin' to go. Parque Jerusalem is a favorite spot for Marilyn and me because the land is "deserty" (our scientific term) and mountainous. It reminds us of Big Bend National Park in Texas, the center of the universe as far as we're concerned. I think we all have certain places or activities that make us feel more spiritual, and that's mine. I feel "primal" there. Being dry, both Big Bend and Parque Jerusalem have another draw for us - they rarely have flying, biting bugs, like mosquitos. That's a real perk when it can take me up to five minutes to get into a car or tent. We'd taken Isabel, Brayan, and Victoria to Parque Jerusalem many times, but never Elias, Lucila, Natasha, or Elaine. 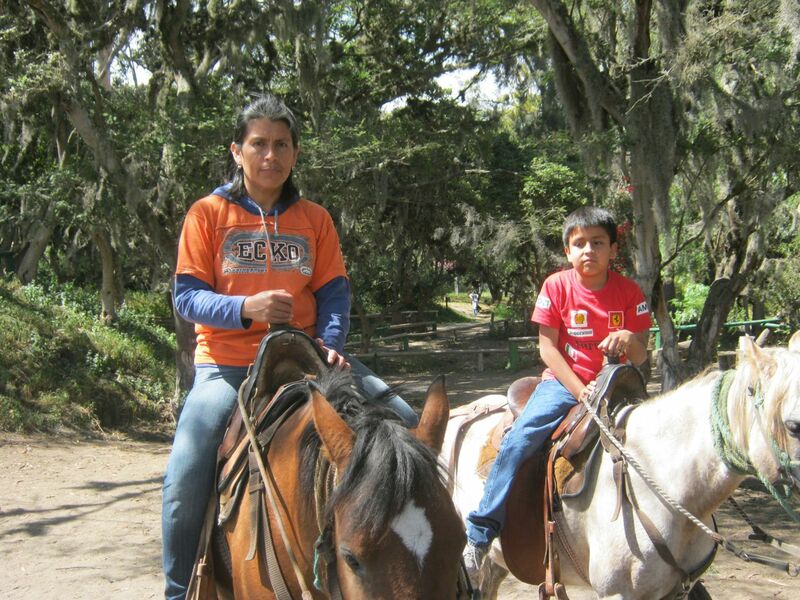 The park is only an hour away, but Lucila and Elias had never visited during their entire lives. The first thing we did was eat a picnic lunch, much to the dismay of Natasha and Brayan. They wanted to get on with the activities. But the grown-ups had a larger voting block. Tickets on the weekend also include a ride on an interpretive "train". The train is actually a very large cart - it seats at least 30 people - pulled by a tractor. A nature interpreter from the park rides along and points out various things, especially when the "train" stops. We take this ride every time we go to Parque Jerusalem on a weekend because at least one of us always learns something new. Finally (according to the kids), it was time to go swimming. Parque Jerusalem has a pool that was bigger, though much shallower, than an Olympic-sized pool. It was filled from a spring, so the water was pretty cold. You weren't going to catch me taking a dip in that thing! It didn't bother the kids, though, and the parents went in with them. 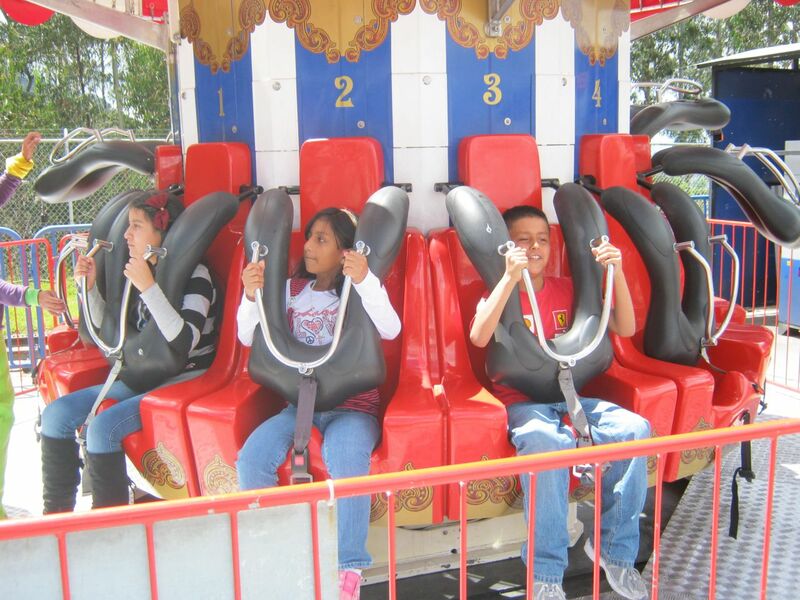 Both Brayan and Natasha had a blast. Meanwhile, I stayed with Victoria in the shade, and Elaine and Marilyn went for a walk on one of the trails. Natasha was pretty tired before we got home, but she had really enjoyed herself, except for once when she got a little scared in the swimming pool. 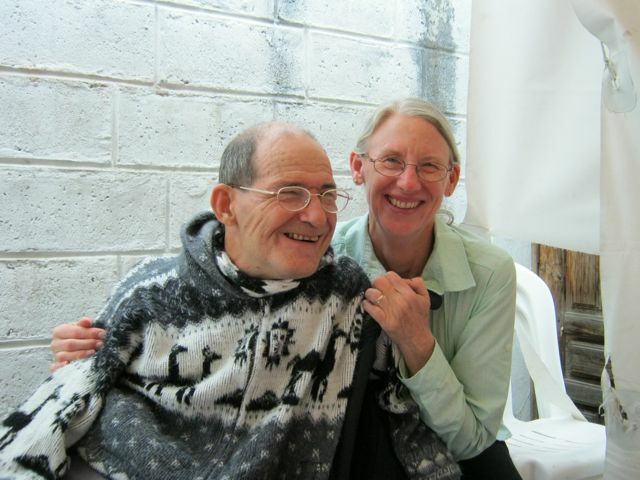 She got her wish: We went to a new place farther away from Otavalo (only one hour). I think she'll really like camping when we get a chance to take her. 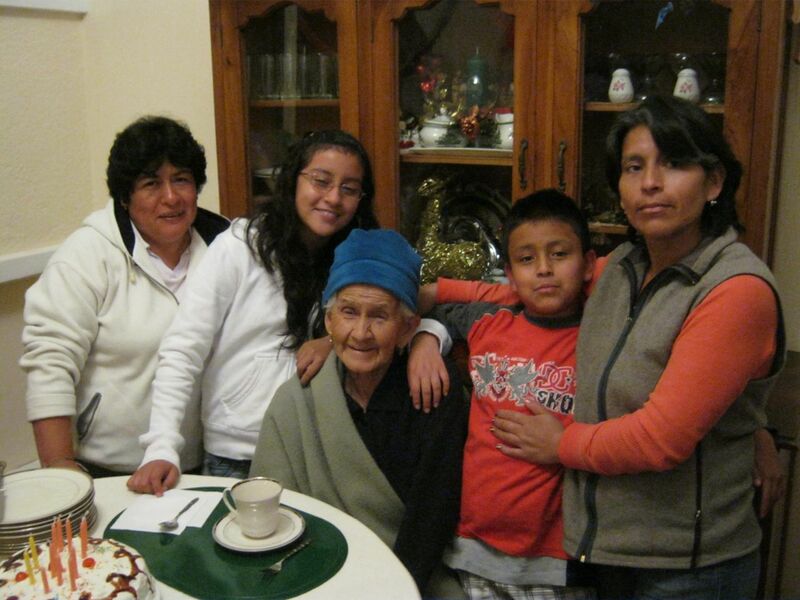 The first time we met Fabiola (Blanca's mother) was in 2010 when Doris (Marilyn's mother) visited us in Ecuador. Blanca had arranged for us to have lunch with her, Luis, Fabiola, and Anita (Blanca's twin sister). We both liked Fabiola immediately. She was warm and sweet. During the ensuing three years we saw her from time to time. She always had a smile on her face and a warm welcome for us, even if it happened to be at the funeral of Arnold, her grandson and Blanca's beloved nephew. 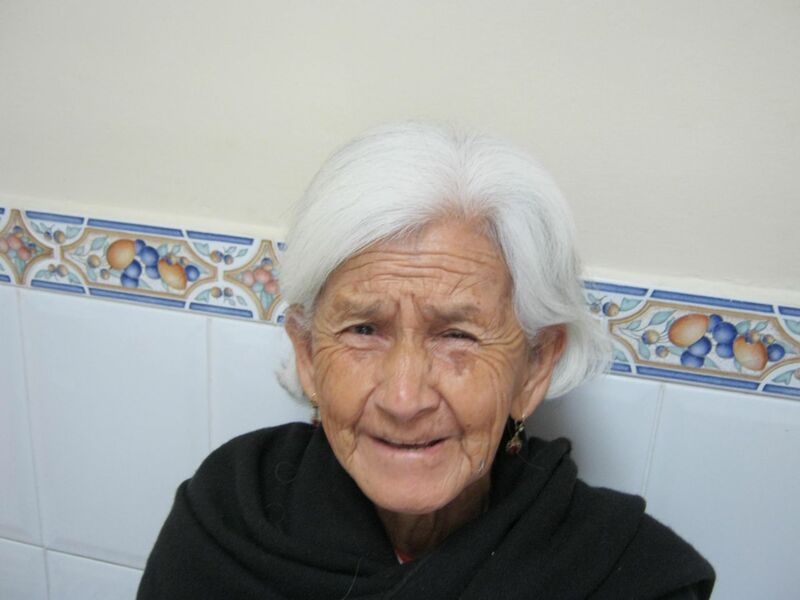 Today Fabiola was put to rest after battling cancer as long as she could. It's a terrible blow to Blanca, Anita, and Fabiola's other children. Even so, they will be sustained through the undying love of a wonderful mother. Fabiola, the rest of us will miss you, too. One day we may get to see your gentle smile again. For the second year in a row, we celebrated the USA’s Independence Day with a picnic. This is a holiday we didn't observe very much when we actually lived in the USA. We were usually maximizing our vacation time around the holiday and didn't really celebrate it unless we happened to be visiting someone who did celebrate it. 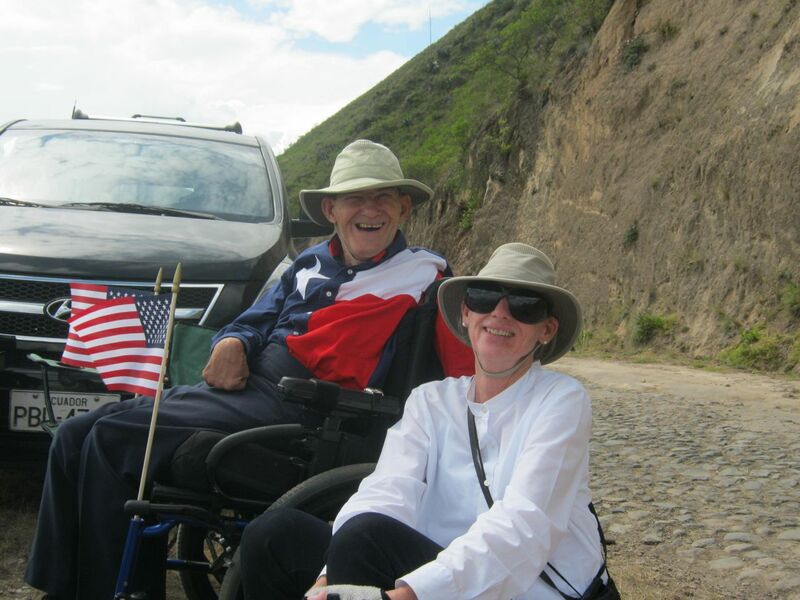 We think about July 4th and it's meaning more now that we're in Ecuador. What's that saying about absence making the heart grow fonder? This year we didn't have the picnic in our backyard. 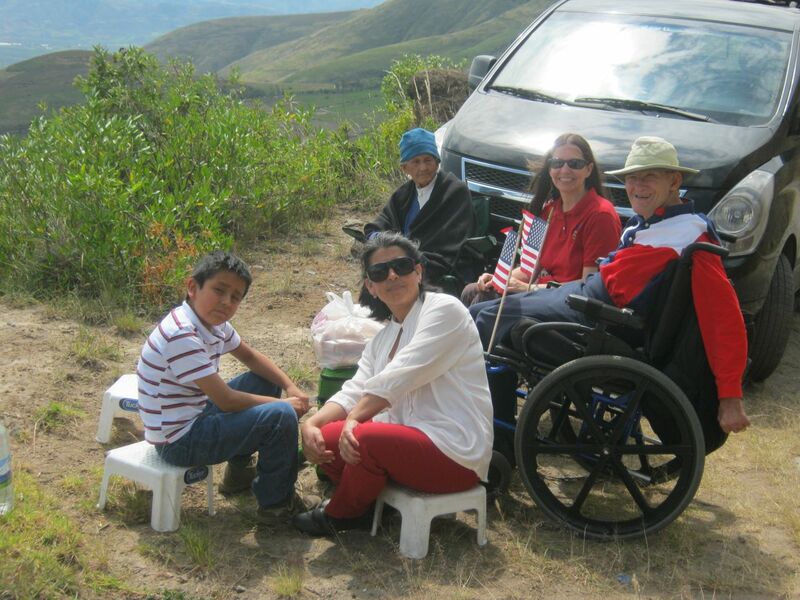 Instead, we and our Ecuadorean family picked up Elaine Keane in Ibarra and drove to one of our favorite picnic spots. It's very high up a mountain and has a great view of Lago Yahuarcocha. The weather was cloudy, but, even so, the view was spectacular. Our picnic spot was on the side of a narrow dirt road. There's not much room for error before you could fall down the steep mountain and possibly keep rolling for about 1,000 feet. My sister-in-law would hate it, but we love it. The last time we visited the USA Marilyn bought two US flags in anticipation of this day. The first thing we did was put them both on my wheelchair. I also had my "Texas Flag" shirt on and it's red, white, and blue. A couple of cars passed by and I could see them look quizzically, as if asking, "What's this fiesta about?" Elaine is a vegetarian, but that didn't stop the rest of us from eating hot dogs we had cooked ahead of time. We also had potato salad and carrot raisin salad, so Elaine was well taken care of. Marilyn had also found some jalapeño peppers (a rarity in Ecuador) to spice up our dogs. We ate high on the hog, so to speak. Of course, another traditional 4th of July food is ice cream. Therefore, when we took Elaine back to Ibarra, we had to stop at - Have you been following this blog for a while? - Rosalie Suarez, our favorite Ecuadorean ice cream. (It would be too expensive to fly Blue Bell down here!) I didn't even get out of the car at Rosalie Suarez because I was too full from eating too many hot dogs. But the rest of our party fittingly topped off the holiday with the traditional desert.